Venezuelan Attorney General Tarek William Saab said officials have identified the suspects involved in Saturday’s alleged assassination attempt on President Nicolas Maduro. The announcement comes after officials said they had arrested six people in connection to the alleged attack. Venezuelan officials said the six people arrested had expressed anti-government sentiment in the past and that two of them had histories of criminal activity. 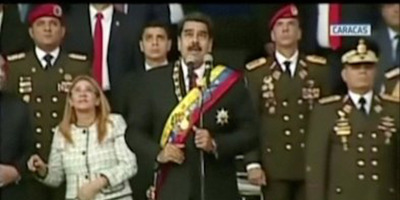 Venezuelan officials have identified the masterminds behind the alleged drone assassination attempt on President Nicolas Maduro, Attorney General Tarek William Saab said on Monday. The announcement comes after officials said they had arrested six suspects in connection to incident on Saturday, in which officials say assailants used explosive-laden drones in an attempt to kill Maduro during a military celebration in Caracas. Saab said on Monday that officials have arrested two drone pilots and know where the drones were piloted from, according to CNN. State television was broadcasting when an explosion was heard during Maduro’s speech. The president was rushed offstage and was not hurt in the attack. Seven other people were injured in the incident, according to The Associated Press. One of the suspects arrested had taken part in 2014 anti-government protests and another had a warrant out for his arrest for allegedly participating in an attack on a military barracks, officials said. All six people arrested have been charged with “terrorism and assassination,” Interior Minister Nestor Reverol said. Maduro and his administration blamed the assassination attempt on the “ultra-right” in Venezuela, US citizens in Florida, and the Colombian President Juan Manuel Santos, but have not provided evidence to support those claims. Colombia and the US have both dismissed the claims. Opposition leaders have denied involvement in Saturday’s explosions. “We warn that the government is taking advantage of this incident… to criminalise those who legitimately and democratically oppose it and deepen the repression and systematic human rights violations,” the Broad Front opposition coalition said in a statement on Twitter. The Caracas Fire Department’s reports on Saturday contrasted the government’s, with fire officials saying the explosion was from a gas leak rather than a drone.